Oscar Friberg is in his third full season with Ostersund. In the last post, we saw how the Ostersund squad had changed completely since Friberg’s arrival, with only six players remaining from the squad Friberg inherited back in June 2017. Of these six players, only three (Kpozo, Pettersson and Bachirou) are considered first-team regulars. In this post, we’ll review the first 20 matches in the Swedish Allsvenskan season and take a look at the 2020 Swedish Cup – Ostersund reached the final of this years competition, but did they win it? Friberg sold or release no squad members this season. He focussed on building his squad and making sure that his side had enough depth to be able to perform in multiple competitions. Of the new players, three stand out as impressive signings and will be shown below. One of the key factors behind signing Gudmundsson was his nationality. Being Swedish, he counts towards our mandatory 9 homegrown players to be selected in each matchday squad. He also fits our system by being able to as an inside forward on the right wing. Rui Santos is by far our best central defender. At just 18 years of age he has plenty of time to get even better too. I’d like to envisage Santos being our rock at the back for many years to come, but I worry that he’s simply just too good for us and the bigger clubs will come sniffing. For the last two seasons we’ve struggled to find a top-class keeper, instead relying on decent, but fallible, options instead. This year things changed. In signing young Nigerian, we’ve found a real star. He’s only 19 but already he’s by far and away the best keeper at our club. Unfortunately he won’t be our player for much longer. Paris Saint-Germain came in with an offer for him in the summer, and of course Udeh wanted to talk with them. Though I didn’t want to sell him, he had a release fee of £2M and although it wasn’t met, I needed to make sure that I negotiated as good a deal for him as I could without accepting a flat £2M. By negotiating PSG’s transfer I have potentially secured a much larger fee than £2M. If Udeh is sold for £10M in the future, Ostersund will receive £5M thanks to the 50% of Next Sale clause I locked into the deal. I also locked in the transfer date ‘End of Season (France) which meant that Udeh wouldn’t leave Ostersund until 1st July 2021, a year away! 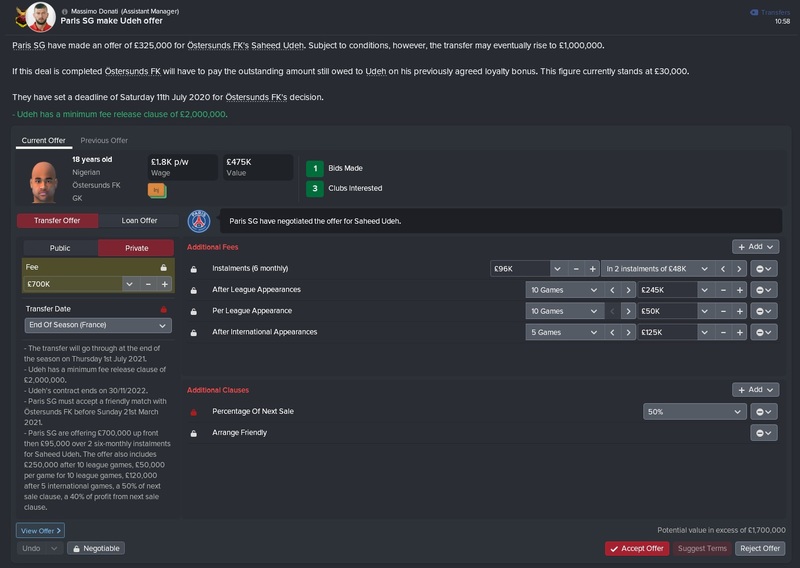 I didn’t want to lose Udeh, but financially this deal could be huge for our club moving forward! After winning our 2nd round fixture last season, we breezed through the group stage of the 2020 Swedish Cup, winning all three games and conceding 0 goals. As a result we were drawn to play against Malmo in the Quarter Final. 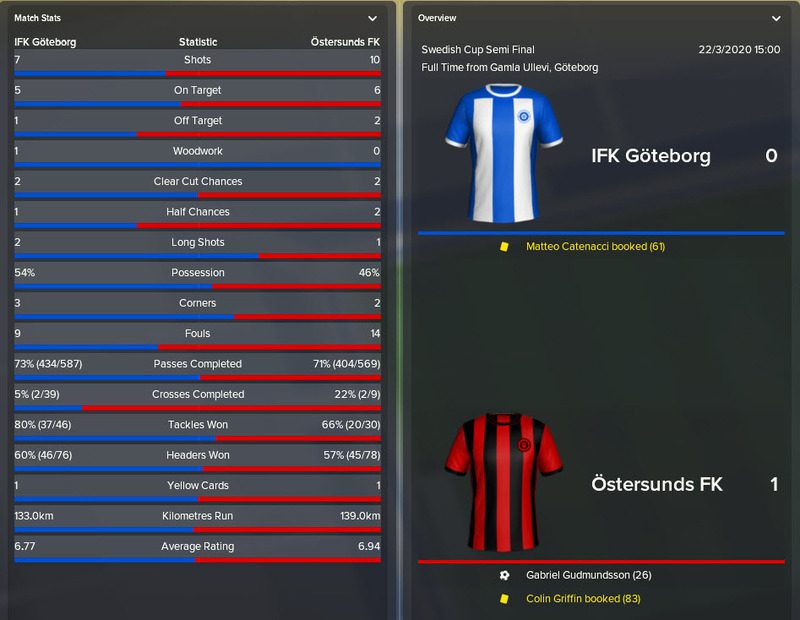 Quite astonishingly, considering our performance against Malmo so far in this save (we had won 0 of 6 previous meetings), we beat Malmo 2-1 and dominated the game. This meant that we would progress to the Semi-Final where we would play Goteborg. 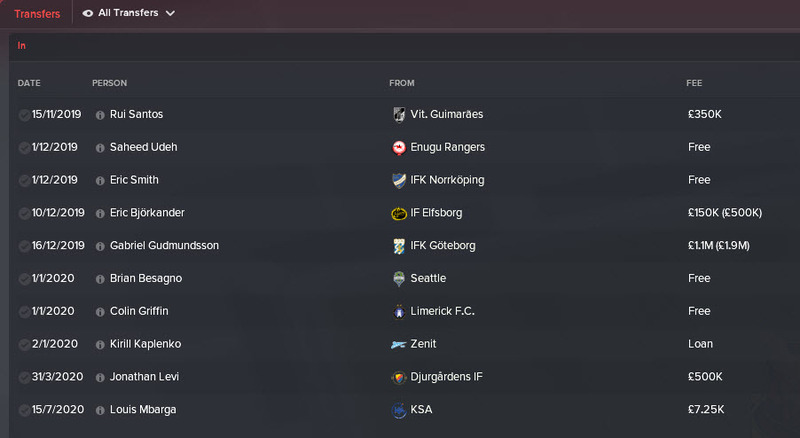 A 1-0 victory meant that Oscar Friberg and his Ostersund side would progress to his first Cup final as manager. Ostersund won the Swedish Cup back in 2017 and will be hoping to replicate this feat when they meet Norrkoping later this season. 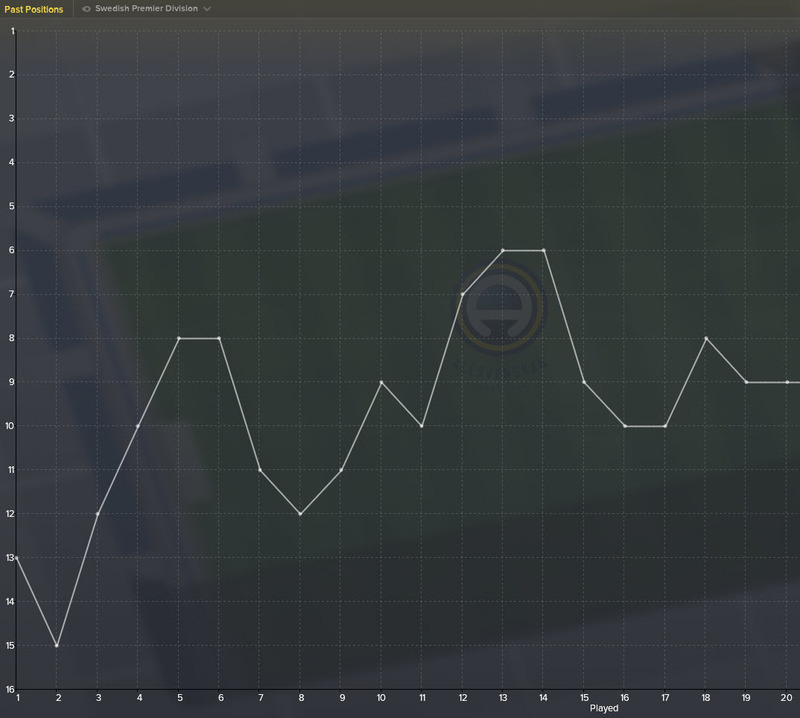 I think it is safe to say that Friberg and co won’t be too pleased with their Swedish league campaign so far. 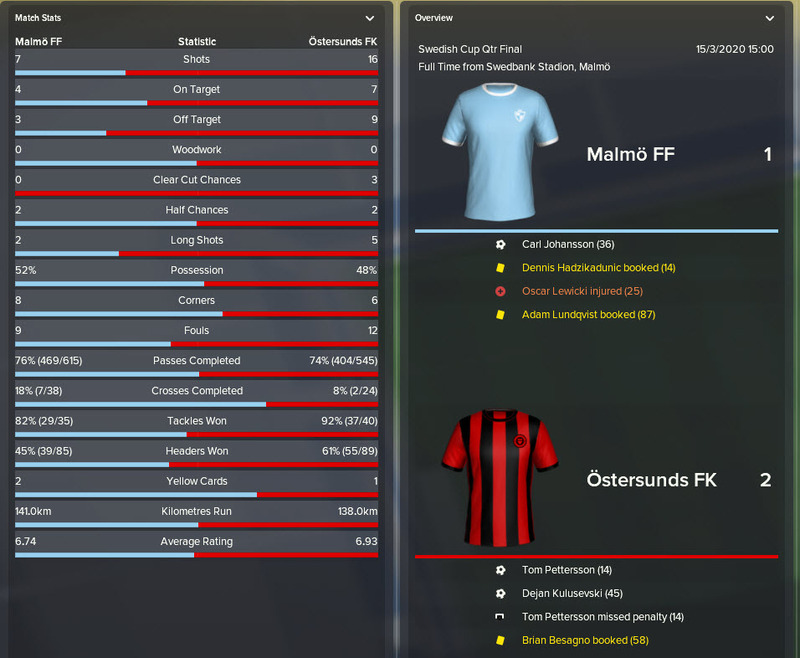 Beginning with a 3-1 home defeat to Orebro and culminating in a 4-0 loss at home to Malmo, Ostersund’s season hasn’t gone as expected. The club were predicted to finish 6th by the media this year but many had tipped Ostersund for a surprise title bid, especially those who followed their transfer dealings closely. But after 20 matches Ostersund sit in 9th position and are some way off where they need to be to qualify for Europe. In last years cup competition, we reached the semi-final where we were knocked out by Norrkoping – we lost 2-1. Sadly for us, in this year’s tie we could not avenge last years defeat. We lost 3-1 and, despite us offering a decent challenge, Norrkoping deserved to win. As you’ll read when looking through our match tweets, the game became very close towards the end as we threw everything at Norrkoping in search of two late goals. Indeed, we scored one, but we were pegged back immediately. Here you can see a video of our goal to make it 2-1. 36 seconds later Norrkoping put the game back beyond doubt by scoring. 36 seconds!!! We put up a brave fight, and we can certainly be proud of our efforts in the Swedish Cup Final, but we clearly lost to the better team. In the next post we will review our final ten games of the 2020 season. Will Ostersund bounce back from their Cup final defeat? This entry was posted in FM18 Stories, Football Manager 2018, Oscar Friberg, Ostersunds FK | @VivaLaVidaFM and tagged fm stories, fm18, football manager, Oscar Friberg, ostersund, sweden, swedish allsvenskan, swedish cup. Bookmark the permalink.